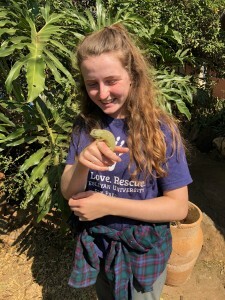 Turner and Serena George ’19 volunteered over the summer at the Chipangali Wildlife Orphanage in Zimbabwe. At the orphanage, their OWU Connection experience included participating in wildlife rehabilitation, conducting human-carnivore research, and helping with conservation education programs. 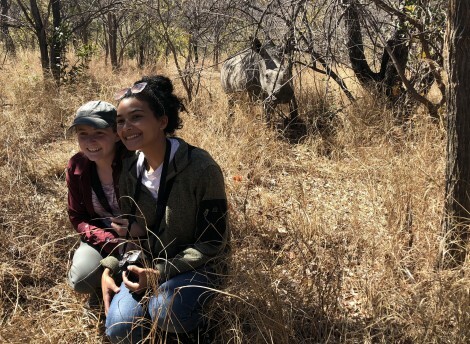 “My favorite moment was when we went on a rhino walk in the Matopos National Park. We were literally within five feet of wild rhinos with a very experienced guide. … It’s insane to me that possibly, in as little as 10 years, there could be no wild rhinos left, and I had a unique opportunity to be so close to them. “Experiences like this one are important because you get the chance to learn a lot and make a difference by being very hands on. “There is so much money, resources, and labor that go into running a rehabilitation center. Although the ultimate goal at Chipangali is to release rehabilitated animals successfully, this is very hard to accomplish for a multitude of reasons. “I actually chose to attend Ohio Wesleyan for The OWU Connection experiences and the Zoology Department.